Welcome to Tha Funk Shop!! 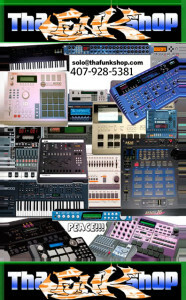 We are here to provide services concerning Turntables, Drum Machines, Samplers & other music gear. From minor repairs to customization, we provide proper maintenance and peace of mind when it comes to your gear functioning properly. We sell old school vintage Turntables & Music gear that has been gone over inspected, tested, upgraded & verified working. We focus on music gear but also sell our DJ Services, T-Shirts, Art, Stickers, Records, Accessories, Toys, Comics, Books & other oddball stuff. We hope you have fun visiting our site and check back in on us from time to time to catch the new deals. We appreciate your time & business, Thank you!! Now check out Tha Funk!! PEACE!! !